Overwrap seals the deal for your media project into a neat little package. The process of overwrapping can be accomplished through a disc duplication service or by purchasing your own overwrapper equipment. This type of packaging is not conducive to curves and typically works if the discs are already enclosed in primary packaging such as CD jewel cases or DVD cases. Overwrap is designed to give your packaging neatly folded edges. 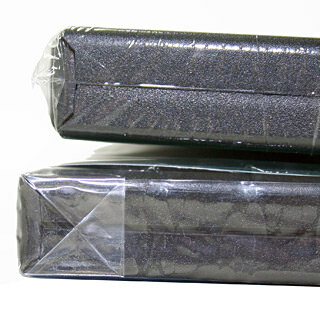 Think of overwrap as the nearly impossible to open wrapper on your brand-new music and movie discs. It makes CD packaging look retail ready and finished. The DVD case at the bottom of this graphic is overwrapped and features a neatly folded edge. The DVD case on top of the graphic has been sealed using shrink wrap. You can see the difference in presentation though they are both equally protective.